Suggestions by the news stations are that if you know anyone that lives in the areas that will be affected by the tsunamis heading toward those nations – to call them now and get them to go to higher ground and alert their neighbors to do so . . .
Earthquake happened in Japan 2 and a half hours ago – it is 3.16 ET am now in Georgia where I live. Tsunamis are racing to other nations now – these are not just one wave – it is a series of large waves with a lot of power to drive onshore carrying debris. It looks like a whirlpool they are showing on CNN out in the ocean right now – that is not good. – That is water. The earthquake was centered 150 km off the coast of Japan. Sendai airport videos didn’t have any planes – – it was affected by the tsunami and is sitting in water as is the entire area. Apparently a number of buildings have been damaged. There are 44 fires reported in six prefectures in Japan – according to ABC World News – just now. There have also been pictures and video of a refinery on fire. The reporters and anchors on ABC World News just mentioned that there are 2 million people that live in Sendai. The earthquake hit during the daytime there while people were at work. There are 13 million people in Tokyo – the earthquake happened northeast of Tokyo. 4 million homes without power. Earlier on the Japanese news press conference they mentioned that the nuclear power plants were not leaking and had been secured after the quake. on CNN a minute ago – there was either a really large boat or a large low building moving in the water like it was nothing but a toy. Probably video from a little while ago actually – maybe. I looked at the USGS charts and the last two days there are a swarm of earthquakes before the 8.9 magnitude quake – and apparently every fifteen minutes or so, they are still occurring with many now around the 5.5 magn. Amazing to see the buildings that stood and provided safe harbor during the earthquake – some videos showing them from inside as the earthquake hit. The dam that has broken swept away 1800 homes – Fukushma ( my guess on the spelling) – The Fukushma Onagawa nuclear plant has been secured now Japan government says radiation rising in a containment building? But, the area has been evacuated within 3 km of it. Supposedly the US military has brought coolant? to it – according to an earlier note to reporters made by Secretary Clinton. And, thank God the tsunami wasn’t large by the time it got to California because people had come out to see it – that has got to change. Earthquake is a shaking of the ground caused by the sudden breaking and shifting of large sections of Earth’s rocky outer shell. Earthquakes are among the most powerful events on earth, and their results can be terrifying. A severe earthquake may release energy 10,000 times as great as that of the first atomic bomb. Rock movements during an earthquake can make rivers change their course. Earthquakes can trigger landslides that cause great damage and loss of life. Large earthquakes beneath the ocean can create a series of huge, destructive waves called tsunamis (tsoo NAH meez)that flood coasts for many miles. Most earthquakes occur along a fault — a fracture in Earth’s rocky outer shell where sections of rock repeatedly slide past each other. Faults occur in weak areas of Earth’s rock. Most faults lie beneath the surface of Earth, but some, like the San Andreas Fault in California, are visible on the surface. Stresses in Earth cause large blocks of rock along a fault to strain, or bend. When the stress on the rock becomes great enough, the rock breaks and snaps into a new position, causing the shaking of an earthquake. There are two kinds of surface waves: (1) Love waves and (2) Rayleigh waves. Love waves travel through Earth’s surface horizontally and move the ground from side to side. Rayleigh waves make the surface of Earth roll like waves on the ocean. Typical Love waves travel at about 23/4 miles (4.4 kilometers) per second, and Rayleigh waves, the slowest of the seismic waves, move at about 21/4 miles (3.7 kilometers) per second. The two types of waves were named for two British physicists, Augustus E. H. Love and Lord Rayleigh, who mathematically predicted the existence of the waves in 1911 and 1885, respectively. Earthquakes can damage buildings, bridges, dams, and other structures, as well as many natural features. Near a fault, both the shifting of large blocks of Earth’s crust, called fault slippage, and the shaking of the ground due to seismic waves cause destruction. Away from the fault, shaking produces most of the damage. Undersea earthquakes may cause huge tsunamis that swamp coastal areas. Other hazards during earthquakes include rockfalls, ground settling, and falling trees or tree branches. The rock on either side of a fault may shift only slightly during an earthquake or may move several feet or meters. In some cases, only the rock deep in the ground shifts, and no movement occurs at Earth’s surface. In an extremely large earthquake, the ground may suddenly heave 20 feet (6 meters) or more. Any structure that spans a fault may be wrenched apart. The shifting blocks of earth may also loosen the soil and rocks along a slope and trigger a landslide. In addition, fault slippage may break down the banks of rivers, lakes, and other bodies of water, causing flooding. In areas where earthquakes are likely, knowing where to build and how to build can help reduce injury, loss of life, and property damage during a quake. Knowing what to do when a quake strikes can also help prevent injuries and deaths. Earth scientists try to identify areas that would likely suffer great damage during an earthquake. They develop maps that show fault zones, flood plains (areas that get flooded), areas subject to landslides or to soil liquefaction, and the sites of past earthquakes. From these maps, land-use planners develop zoning restrictions that can help prevent construction of unsafe structures in earthquake-prone areas. Engineers have developed a number of ways to build earthquake-resistant structures. Their techniques range from extremely simple to fairly complex. For small- to medium-sized buildings, the simpler reinforcement techniques include bolting buildings to their foundations and providing support walls called shear walls. Shear walls, made of reinforced concrete (concrete with steel rods or bars embedded in it), help strengthen the structure and help resist rocking forces. Shear walls in the center of a building, often around an elevator shaft or stairwell, form what is called a shear core. Walls may also be reinforced with diagonal steel beams in a technique called cross-bracing. Builders also protect medium-sized buildings with devices that act like shock absorbers between the building and its foundation. These devices, called base isolators, are usually bearings made of alternate layers of steel and an elastic material, such as synthetic rubber. Base isolators absorb some of the sideways motion that would otherwise damage a building. Skyscrapers need special construction to make them earthquake-resistant. They must be anchored deeply and securely into the ground. They need a reinforced framework with stronger joints than an ordinary skyscraper has. Such a framework makes the skyscraper strong enough and yet flexible enough to withstand an earthquake. Earthquake-resistant homes, schools, and workplaces have heavy appliances, furniture, and other structures fastened down to prevent them from toppling when the building shakes. Gas and water lines must be specially reinforced with flexible joints to prevent breaking. Safety precautions are vital during an earthquake. People can protect themselves by standing under a doorframe or crouching under a table or chair until the shaking stops. They should not go outdoors until the shaking has stopped completely. Even then, people should use extreme caution. A large earthquake may be followed by many smaller quakes, called aftershocks. People should stay clear of walls, windows, and damaged structures, which could crash in an aftershock. Scientists have developed a theory, called plate tectonics, that explains why most earthquakes occur. According to this theory, Earth’s outer shell consists of about 10 large, rigid plates and about 20 smaller ones. Each plate consists of a section of Earth’s crust and a portion of the mantle, the thick layer of hot rock below the crust. Scientists call this layer of crust and upper mantle the lithosphere. The plates move slowly and continuously on the asthenosphere, a layer of hot, soft rock in the mantle. As the plates move, they collide, move apart, or slide past one another. The movement of the plates strains the rock at and near plate boundaries and produces zones of faults around these boundaries. Along segments of some faults, the rock becomes locked in place and cannot slide as the plates move. Stress builds up in the rock on both sides of the fault and causes the rock to break and shift in an earthquake. There are three types of faults: (1) normal faults, (2) reverse faults, and (3) strike-slip faults. In normal and reverse faults, the fracture in the rock slopes downward, and the rock moves up or down along the fracture. In a normal fault, the block of rock on the upper side of the sloping fracture slides down. In a reverse fault, the rock on both sides of the fault is greatly compressed. The compression forces the upper block to slide upward and the lower block to thrust downward. In a strike-slip fault, the fracture extends straight down into the rock, and the blocks of rock along the fault slide past each other horizontally. Most earthquakes occur in the fault zones at plate boundaries. Such earthquakes are known as interplate earthquakes. Some earthquakes take place within the interior of a plate and are called intraplate earthquakes. Interplate earthquakes occur along the three types of plate boundaries: (1) mid-ocean spreading ridges, (2) subduction zones, and (3) transform faults. Mid-ocean spreading ridges are places in the deep ocean basins where the plates move apart. As the plates separate, hot lava from Earth’s mantle rises between them. The lava gradually cools, contracts, and cracks, creating faults. Most of these faults are normal faults. Along the faults, blocks of rock break and slide down away from the ridge, producing earthquakes. Near the spreading ridges, the plates are thin and weak. The rock has not cooled completely, so it is still somewhat flexible. For these reasons, large strains cannot build, and most earthquakes near spreading ridges are shallow and mild or moderate in severity. Subduction zones are places where two plates collide, and the edge of one plate pushes beneath the edge of the other in a process called subduction. Because of the compression in these zones, many of the faults there are reverse faults. About 80 per cent of major earthquakes occur in subduction zones encircling the Pacific Ocean. In these areas, the plates under the Pacific Ocean are plunging beneath the plates carrying the continents. The grinding of the colder, brittle ocean plates beneath the continental plates creates huge strains that are released in the world’s largest earthquakes. The world’s deepest earthquakes occur in subduction zones down to a depth of about 450 miles (700 kilometers). Below that depth, the rock is too warm and soft to break suddenly and cause earthquakes. Transform faults are places where plates slide past each other horizontally. Strike-slip faults occur there. Earthquakes along transform faults may be large, but not as large or deep as those in subduction zones. One of the most famous transform faults is the San Andreas Fault. The slippage there is caused by the Pacific Plate moving past the North American Plate. The San Andreas Fault and its associated faults account for most of California’s earthquakes. Intraplate earthquakes are not as frequent or as large as those along plate boundaries. The largest intraplate earthquakes are about 100 times smaller than the largest interplate earthquakes. Intraplate earthquakes tend to occur in soft, weak areas of plate interiors. Scientists believe intraplate quakes may be caused by strains put on plate interiors by changes of temperature or pressure in the rock. Or the source of the strain may be a long distance away, at a plate boundary. These strains may produce quakes along normal, reverse, or strike-slip faults. To determine the strength and location of earthquakes, scientists use a recording instrument known as a seismograph. A seismograph is equipped with sensors called seismometers that can detect ground motions caused by seismic waves from both near and distant earthquakes. Some seismometers are capable of detecting ground motion as small as 0.1 nanometer. One nanometer is 1 billionth of a meter or about 39 billionths of an inch. Scientists called seismologists measure seismic ground movements in three directions: (1) up-down, (2) north-south, and (3) east-west. The scientists use a separate sensor to record each direction of movement. A seismograph produces wavy lines that reflect the size of seismic waves passing beneath it. The record of the wave, called a seismogram, is imprinted on paper, film, or recording tape or is stored and displayed by computers. Probably the best-known gauge of earthquake intensity is the local Richter magnitude scale, developed in 1935 by United States seismologist Charles F. Richter. This scale, commonly known as the Richter scale, measures the ground motion caused by an earthquake. Every increase of one number in magnitude means the energy release of the quake is about 32 times greater. For example, an earthquake of magnitude 7.0 releases about 32 times as much energy as an earthquake measuring 6.0. An earthquake with a magnitude of less than 2.0 is so slight that usually only a seismometer can detect it. 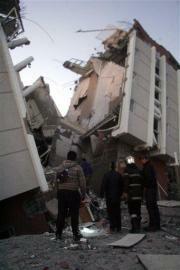 A quake greater than 7.0 may destroy many buildings. The number of earthquakes increases sharply with every decrease in Richter magnitude by one unit. For example, there are 8 times as many quakes with magnitude 4.0 as there are with magnitude 5.0. Although large earthquakes are customarily reported on the Richter scale, scientists prefer to describe earthquakes greater than 7.0 on the moment magnitude scale. The moment magnitude scale measures more of the ground movements produced by an earthquake. Thus, it describes large earthquakes more accurately than does the Richter scale. The largest earthquake ever recorded on the moment magnitude scale measured 9.5. It was an interplate earthquake that occurred along the Pacific coast of Chile in South America in 1960. The largest intraplate earthquakes known struck in central Asia and in the Indian Ocean in 1905, 1920, and 1957. These earthquakes had moment magnitudes between about 8.0 and 8.3. The largest intraplate earthquakes in the United States were three quakes that occurred in New Madrid, Missouri, in 1811 and 1812. The earthquakes were so powerful that they changed the course of the Mississippi River. During the largest of them, the ground shook from southern Canada to the Gulf of Mexico and from the Atlantic Coast to the Rocky Mountains. Scientists estimate the earthquakes had moment magnitudes of 7.5. Scientists locate earthquakes by measuring the time it takes body waves to arrive at seismographs in a minimum of three locations. From these wave arrival times, seismologists can calculate the distance of an earthquake from each seismograph. Once they know an earthquake’s distance from three locations, they can find the quake’s focus at the center of those three locations. Scientists can make fairly accurate long-term predictions of where earthquakes will occur. They know, for example, that about 80 percent of the world’s major earthquakes happen along a belt encircling the Pacific Ocean. This belt is sometimes called the Ring of Fire because it has many volcanoes, earthquakes, and other geologic activity. Scientists are working to make accurate forecasts on when earthquakes will strike. Geologists closely monitor certain fault zones where quakes are expected. Along these fault zones, they can sometimes detect small quakes, the tilting of rock, and other events that might signal a large earthquake is about to occur. Most of what is known about the internal structure of Earth has come from studies of seismic waves. Such studies have shown that rock density increases from the surface of Earth to its center. Knowledge of rock densities within Earth has helped scientists determine the probable composition of Earth’s interior. Scientists have found that seismic wave speeds and directions change abruptly at certain depths. From such studies, geologists have concluded that Earth is composed of layers of various densities and substances. These layers consist of the crust, mantle, outer core, and inner core. Shear waves do not travel through the outer core. Because shear waves cannot travel through liquids, scientists believe the outer core is liquid. Scientists believe the inner core is solid because of the movement of compressional waves when they reach the inner core. Contributor: Karen C. McNally, Ph.D., Professor of Earth Sciences, University of California, Santa Cruz. View with “Windows Media Player” or “Flash Player“. (AP) — Scientists say the major earthquake that struck off the coast of Chile was a “megathrust” – similar to the 2004 Indian Ocean temblor that spawned a catastrophic tsunami. Megathrust earthquakes occur in subduction zones where plates of the Earth’s crust grind and dive. Saturday’s jolt occurred when the Nazca plate dove beneath the South American plate, releasing tremendous energy. The U.S. Geological Survey says 13 temblors of magnitude-7 or larger have hit coastal Chile since 1973. The latest quake occurred about 140 miles north of the largest earthquake ever recorded. The magnitude-9.5 struck southern Chile in 1960, killing some 1,600 people and generating a tsunami that killed another 200 people in Japan, Hawaii and the Philippines. The difference is that the earthquake in Chile yesterday morning at 23 hours ago, was much deeper – 35 kilometers down. Now, there are 300 people listed as killed during the earthquake. SANTIAGO, Chile—Some 1.5 million homes were damaged by the powerful earthquake that struck central Chile, Housing Minister Patricia Poblete said Saturday. The figure includes half a million homes “with severe damage” that will “probably not be able to be lived in again,” Poblete told reporters. The city of Concepcion, some 440 kilometers (273 miles) southwest of Santiago, and its surrounding area was especially hard-hit. The Liquiñe-Ofqui Fault marked with red. The Liquiñe-Ofqui Fault is major geological fault that runs a length of roughly 1000 km in a north-south direction and exhibits current seismicity . It is located in the Chilean northern patagonean Andes. As the name implies it runs from the Liquiñe hot springs in the north to the Ofqui Isthmus in the south, where the Antarctic Plate meets the Nazca Plate and the South American Plate in Chile Triple Junction. A large parth of the fault runs along the Moraleda Channel. North of Liquiñe the fault is gradually converted into a compression area. At Quetrupillán volcano the fault is crossed by the Gastre Fault Zone. It may be classified as a dextral intra-arc transform fault. The 1960 eruption of Cordón Caulle soon after the Great Chilean Earthquake was triggered by movements in the fault. The Aysén Fjord earthquake in 2007 and the eruption of Chaitén Volcano in 2008 are belivied to have been caused by movements in the fault. magnetic polarity reversal. A change of the earth’s magnetic field to the opposite polarity that has occurred at irregular intervals during geologic time. Polarity reversals can be preserved in sequences of magnetized rocks and compared with standard polarity-change time scales to estimate geologic ages of the rocks. Rocks created along the oceanic spreading ridges commonly preserve this pattern of polarity reversals as they cool, and this pattern can be used to determine the rate of ocean ridge spreading. The reversal patterns recorded in the rocks are termed sea-floor magnetic lineaments. (PhysOrg.com) — In the classical world, scientists can make measurements with a degree of accuracy that is restricted only by technical limitations. At the fundamental level, however, measurement precision is limited by Heisenberg’s uncertainty principle. But even reaching a precision close to the Heisenberg limit is far beyond existing technology due to source and detector limitations. Heisenberg’s uncertainty principle ultimately limits the achievable precision depending on how many quantum resources are used for the measurement. For example, gravitational waves are detected with laser interferometers, whose precision is limited by the number of photons available to the interferometer within the duration of the gravitational wave pulse. However, devising an optimal policy is difficult, and usually requires guesswork. In their study, Hentschel and Sanders adapted a technique from the field of artificial intelligence. Their algorithm autonomously learns an optimal policy based on trial and error – replacing guesswork by a logical, fully automatic, and programmable procedure.